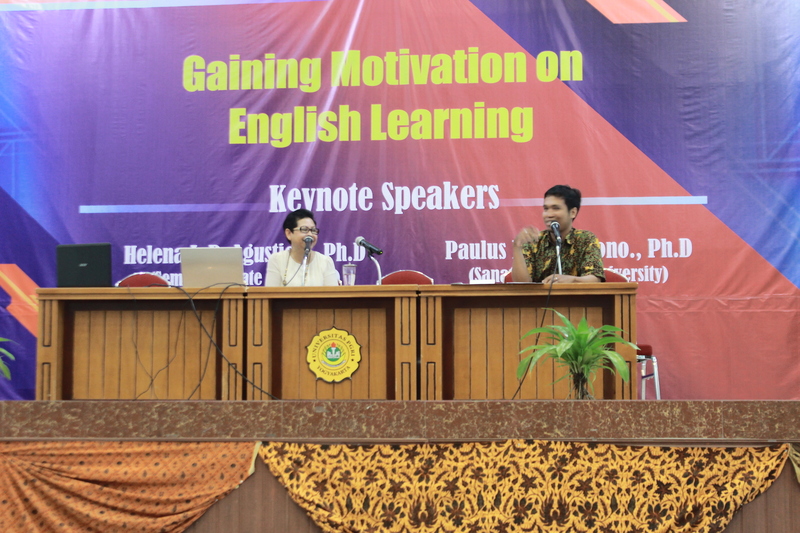 Saturday, October 13th 2016 English Education Study Program of PGRI University of Yogyakarta organize The National Seminar that were talk about “ GAINING MOTIVATION TO LEARN ENGLISH” with keynote speaker are Mr.Paulus Kuswantoro, Ph.D from Sanata Dharma University and Ms.Helena I. R. Agustien, Ph.D from Semarang State University . They were talked about how the importance learning English in education and how learning English to be more easy and make sure that learning English is fun. In addition they were gave the solution to applicant of educator about how the educator should do if they are be a teacher in School. The first , this seminar was opened by Mr.Rudha Widagsa as the chief of English Education Study Program that in his speech says “ the student’s ability are different each other” so the educator should have the clever in teaching english” and the second opened by Mr.Andi Dian Rahmawan that he marked this seminar is a knowledge or lesson to applicant of educator in order to be a good teacher for the next generation” so Mr.Andi Dian Rahmawan also required to all participant of the seminar to listened carefully the keynote’s speech . In Ms.Helena’s speech , she was talked how the first step that must to do the learner if they are want learning English easily is learn about the based of English are grammar and tenses as the student’s foundation that can be scalable in learning English. How the learner in dept ? Ms.Helena says that the learner must know very well the tenses , can distinguish the form of verb in tenses that are make sure we can learn English easily. The ways we can know very well the tenses is memorize everyday and every time, do something that can be raise our’s tenses comprehension for example : try to speak English everyday with friends, teacher and always ask the suggestion , try to speak English in front of mirror this method can train the mental and the confidence to speak English goodly. (1) Brings the book to story ( reading book ) from this media the learner teachable how to read quickly , skimming the story and make the main idea from the story. This ways capable to learner receive many new vocabulary . (2) Sing a Songs , used the fun media is important to teach English Learning. Sing a Song is effective media that should used in the learning, through the song the learner can enjoy the lesson and easily to acquire many vocabulary. Beside this ways is fun and interesting , sing a songs capable make a learning situation be enjoy .